Definition at line 23 of file CLTransformation.h. Definition at line 28 of file CLTransformation.cpp. Constructor with values for the matrix. Constructor with id and values for the matrix. Definition at line 41 of file CLTransformation.cpp. Returns a string to represent the 3D transformation. Definition at line 125 of file CLTransformation.cpp. Returns the 3D identity matrix. The matrix contains 12 values. Definition at line 77 of file CLTransformation.cpp. 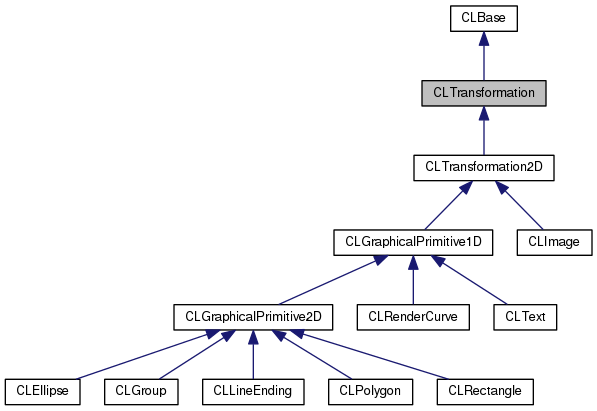 Referenced by CLGroupAttributes::CLGroupAttributes(), and CLLayoutRenderer::draw_curve(). Returns the matrix. The matrix contains 12 values. Definition at line 68 of file CLTransformation.cpp. Checks if the transformation is a 2D transformation, i.e. we have to check some of the values. Definition at line 112 of file CLTransformation.cpp. Returns true if the matrix is the identity matrix. Definition at line 103 of file CLTransformation.cpp. Returns true if the matrix has been set or false otherwise. Definition at line 87 of file CLTransformation.cpp. Referenced by CLLayoutRenderer::extract_transformation_attributes(), CCopasiXML::saveTransformationAttributes(), and transform(). Sets the transformation matrix from the given string. The string has to contain 12 numerical values seperated by ",". Otherwise the matrix is set to the identity matrix. Definition at line 145 of file CLTransformation.cpp. References IDENTITY3D, mMatrix, and setMatrix(). Definition at line 54 of file CLTransformation.cpp. Referenced by parseTransformation(), and CLTransformation2D::setMatrix(). Definition at line 29 of file CLTransformation.h. Referenced by CLTransformation2D::CLTransformation2D(), getIdentityMatrix(), isIdentityMatrix(), and parseTransformation(). Definition at line 26 of file CLTransformation.h. Referenced by CLTransformation(), CLTransformation2D::CLTransformation2D(), get3DTransformationString(), getMatrix(), is2DTransformation(), isIdentityMatrix(), isSetMatrix(), parseTransformation(), setMatrix(), CLTransformation2D::updateMatrix2D(), and CLTransformation2D::updateMatrix3D().